Juventus extended their lead at the top of Serie A to eight points with an impressive victory over Roma. Antonio Conte fielded his preferred starting eleven, as he welcomed back Andrea Pirlo from injury. Rudi Garcia made no significant changes to his 4-3-3. Francesco Totti, Gervinho and Adem Ljajic led the line, while Kevin Strootman, Miralem Pjanic and Daniele De Rossi formed a midfield trio. 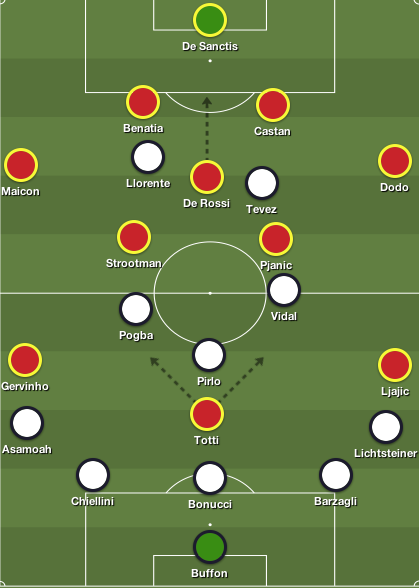 This fixture had no major tactical theme – Juventus’ approach without the ball nullified Roma’s main attacking threat. 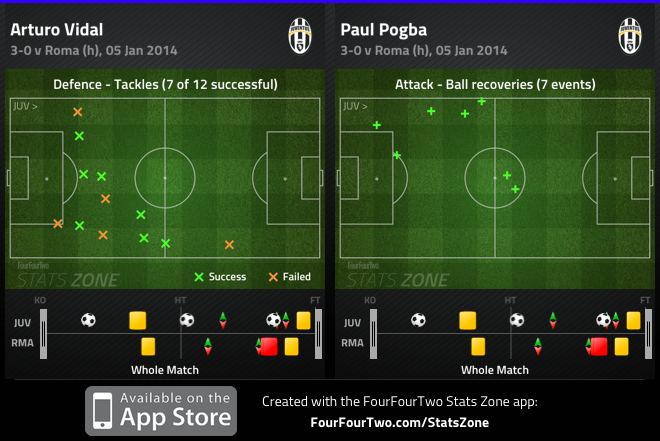 One of the most significant feats in this match was Juventus’ approach without the ball. Opposed to bringing the match to the away side, Conte instructed his men to sit deep in their half and minimize space between the lines for Totti to drift into. This approach was logical because it ensured there was no space behind the Juventus backline to attack on the counter and Totti would be unable to drag defenders out of position. Conte’s men sat in two compact banks of four, with Carlos Tevez and Fernando Llorente sitting a few yards ahead of the midfield to maintain Juventus’ shape. Conte’s midfield trio sat in front of the back line, as Juventus became a 5-3-2, considering Stephan Lichtsteiner and Kwadwo Asamoah sat deeper then usual. Vidal and Pogba pushed out wide when Roma’s fullbacks received the ball, to prevent them from pushing forward, and they diligently dropped deeper to ensure that their wingback wasn’t isolated against Roma’s front three – this meant Tevez and Llorente dropped into these central areas preserve structure in midfield. Juventus’ approach out of possession was significant – Garcia’s men were left flabbergasted in possession, as the home side stifled their main attacking threats. Juventus’ reactive approach meant Roma enjoyed majority of the possession throughout the match. Apart from Tevez occasionally closing down defenders, and Juventus’ attempt to press from goal-kicks, Roma’s centrebacks, along with De Rossi, were free to push forward. The issue that Roma encountered – besides Juventus’ great organization – was their slow ball circulation and a focal point in attack. Strootman retained possession well and Pjanic – who looked injured – attempted to penetrate, but the midfielders’ impact was minimal. Gervinho was caught offside when he broke into good positions, and was always put into 1v2 situations when he intended on isolating a wingback – and Ljajic drifted infield desperately looking for gaps to penetrate. Totti found it difficult to grow into the match, and he failed to create space for Roma’s attacker to run into. Whenever Totti dropped deep to receive the ball the closest Juventus centreback stuck tight to the Italian – Vidal also tracked his movement and closed Totti down when he roamed around the halfway line. Ultimately, the only way Roma could create an opportunity to expose Juventus on the counter would be to press the Juventus backline higher up the pitch, or force them to concede possession in their third, and quickly commit men forward. Ljajic received a great chance early in the match when Totti dispossessed Leonardo Bonucci, but besides that effort, Buffon made routine saves to preserve his clean sheet. Despite monopolizing majority of the possession, the away side rarely created legitimate goal-scoring opportunities because they couldn’t find openings in Juventus’ shape. The ball circulation was slow, their playmakers were nullified, and there was no space in the final third for Gervinho to attack. Although Roma opted to drop into their shape and allow Juventus’ centrebacks to play from the back, Garcia instructed his men to press Pirlo. Totti was handed the duty to track the Italian maestro, and Pjanic occasionally stepped in when Totti was out of position. Garcia’s attempt to nullify Pirlo was logical, but as the game wore on, the Italian found it easier to receive the ball and build attacks from deep – this was down to fitness levels, and Roma’s lack of structure without the ball. On the other hand, De Rossi was free to play passes from deep – he often switched balls towards the fullbacks, but rarely played long diagonal balls or forward penetrating passes. De Rossi’s passing was conservative, and while his passing rate was phenomenal, it didn’t influence Roma’s attack. Here, De Rossi often dropped between the two Roma centre-backs to ensure a numerical advantage at the back, and help push Dodo and Maicon forward. Although neither man dominated the match from midfield, both held pivotal roles – Pirlo helped Juventus get into better attacking positions as the match wore on, whereas De Rossi’s presence prevented Juventus’ strike force from isolating the Roma’s centrebacks. The home side’s threat from open-play was minimal, but they efficiently executed set-pieces. In fairness, Pogba and Vidal ignited attacks on the break, but their final ball let them down – however, Roma looked vulnerable defending set-pieces, and Juventus took advantage. Juventus’ opening goal came from a simple Lichtsteiner throw-in that led to the Swiss wingback playing a pass into Tevez, who cleverly turned De Rossi, slid an incisive ball towards Vidal, and the Chilean beat Morgan De Sanctis at the near post. 20 minutes later, Pirlo tricked the Roma defence into thinking he’d play a ball into the six-yard box, and laid it off to Pogba, whose shot was blocked – Roma failed to clear their lines and Barzagli’s diagonal pass to Tevez subsequently led to the Argentinian striker whipping a ball across the six-yard box, which Bonucci couldn’t latch onto. Bonucci doubled the home side’s lead minutes into the second half, when he broke free from Leandro Castan and guided in Pirlo’s free-kick at the far post. Roma further displayed their inability to defend set-pieces when Chiellini nodded back Pirlo’s free-kick at the far post and Castan handled the ball in the area, thus leading to his dismissal and a penalty, which Mirko Vucinic converted. Although Juventus’ influence from open-play was minimal, Conte’s men exposed Roma through set-pieces, and were rewarded with three goals. Garcia opted to bring on Mattia Destro and Vasilis Torosidis for Pjanic and Dodo, as Roma moved to a 4-2-3-1. The move was logical as Roma now possessed a focal point in attack, but unfortunately for the away side, they struggled to get the ball into Destro – Pjanic’s departure deprived the away side of any penetration, as they were left with Strootman’s complacent passing and De Rossi in a deeper role. Garcia’s final attempt to alter the match saw Alessandro Florenzi replace Totti, but De Rossi and Castan were sent off within four minutes of his introduction. With Roma down to nine-men away from home against the champions, the match was over, and Juventus comfortably sustained their two-goal lead. Juventus’ defensive solidity and set-piece efficiency merited three points – this was far from their best performance of the season, yet their defensive display was superb, as Conte’s men stifled Roma’s attack. Roma dominated possession for large portions of the match, but the away side lacked invention, guile and penetration when they broke into Juventus’ half. Garcia’s men circulated the ball too slow, allowing Juventus to maintain their shape, while their set-piece defending was abysmal. Roma have overachieved by some margin this season – considering this is their first loss of the season – and if they can positively bounce back from this result, then the title race is far from over. Roma’s overall performance wasn’t great – nor was it poor – here, they lost to a better side, executing a well-thought-out approach.